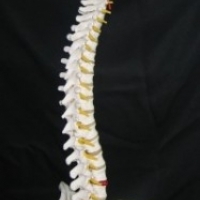 Life-size vertebral column with pelvis, sacrum, occipital bone as well as nerve branches and herniated L4-5 disc. 29" tall. Stand included.